Those who volunteer for fields will help out with the seasonal set ups for the spring and fall seasons. These set up days are 1 - 2 weeks prior to the start of each season. In the fall, look to help in mid to late July. In the spring, it's usually the end of March. On set up days we line the fields and repair goals and do any field or equipment tasks needed to kick off the seasons. On set up days, it usually takes about 2 hours to set up a field. After the fields are set up, individuals can volunteer to perform weekly lining of fields during the season. This is an easy task as you just follow the lines. Lining a field should take no more than an hour. Field set up days are a good time to learn how. I've found this little video below from the Stanford Soccer Club on YouTube if you'd like additional instruction on field lining. Below are the guidelines to follow when helping out with the field maintenance. Fields must be lined EVERY week RAIN or SHINE, PLAY or NO PLAY, so plan accordingly. Lining should be done between Thursday evenings and Friday by 7:00pm. This is so it can be completed before any games start during the season. During the seasons, goals may need to be re-tied. There are wire ties located in the IPW and King sheds, as well as the Meyer Way trailer. Goal anchors may also become loose or dislodged due to them being moved. Anyone in the club may make any repairs to unsafe conditions. Grass is generally cut at all sites on Thursday’s. WSC does not cut the grass. Signup Genius will be used to allow parents to signup for the date and location that they wish. If you notice something unsafe or in need of repair please notify the Soccer Club Office ( exec-dir@warringtonsoccerpa.org or fields@warringtonsoccerpa.org )immediately. You may also make the necessary on the spot repairs as need to insure the safety of our children. As we are a VOLUNTEER organization, all parents and Field Volunteers should assure that all fields are safe and goals are properly secured prior to all games. ALL EMPTY PAINT CANS SHOULD BE PLACED IN THE TURK OR IPW DUMPSTER. DO NOT PUT EMPTY PAINT CANS IN THE TOWNSHIP TRASH CANS AT ANY OF OUR SITES. Put away all corner flags. Pick up all trash and put in trash can, recycle can or dumpster. If there is not a trash receptacle at your field site, please take it with you. You can throw it away in the dumpster at IPW. Make sure all doors and lock boxes are closed and locked, including the garage doors at IPW. Make sure all lights and fans are shut off in the shed before locking and closing the door. Meyer Way – the flags should be in the trailer behind the township shed if not on the fields. Last games of the day, please place the flags back into the shed (or in the trailer behind the township shed @ Meyer Way). Feel free to repair nets and flags as needed to help keep the fields in the best playable shape possible. The code to the IPW shed lock is GOAL (on your phones), or 4625. All paint, line machines, plastic ties for net repair, corner flags are in the shed. The Parks and Rec. Dept. have placed blue recycle containers around IPW. Please use them for plastic and cans, (not paint cans), instead of the trash cans and dumpster. The IPW shed is the main hub for all equipment. Please discard all trash and empty paint cans in the dumpster at IPW, not back in the shed. If you need paint for Meyer Way, please take it from the Turk Shed. Empty paint cans and boxes should be discarded in the green dumpsters at the end of the parking lot closer to Turk Rd, not back in the shed. There is a new white trailer behind the township shed. The combo to the lock is GOAL (on your phones), or 4625. Dispose of the empties in a dumpster at either Turk or IPW. Do not place empties in the trash cans at Meyer Way or back in the trailer. There is a new lock box behind the back stop of the baseball field.. There should be a key on the side to open the box. Please return the key to its spot when you are finished. Dispose of the empties in a dumpster at either Turk or IPW. Do not place empties in the trash cans at Jamison or back in the lock box. 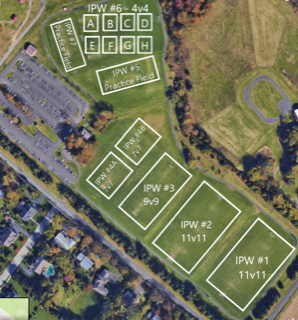 You will need to obtain a line painter and paint from one of the other locations (IPW, Turk, Jamison or Meyer Way) before arriving to line the field. The handle pulls out of the base by lifting the arm for easier transportation. One case of paint per field is sufficient. Please return the equipment to IPW when finished. Make sure you take enough paint, no less than a case of 12 cans, with you when you head out to the fields. It’s easier to just throw a case in the paint machine and go. Put lids back on empty cans, turn upside down in box and throw in dumpster. Please do not take trash back to the shed. Allow at least one hour prior to game time to line a field.